An area of marsh in Western Nuerland at the end of the rainy season. Evans-Pritchard notes that during a seventeen day tour of the area in October of 1936 he rarely found himself on dry land. Note on print reverse ms pencil - "6 W.Nuer" & print front border ms ink - "NUER XIV/64"
Morton, Chris. 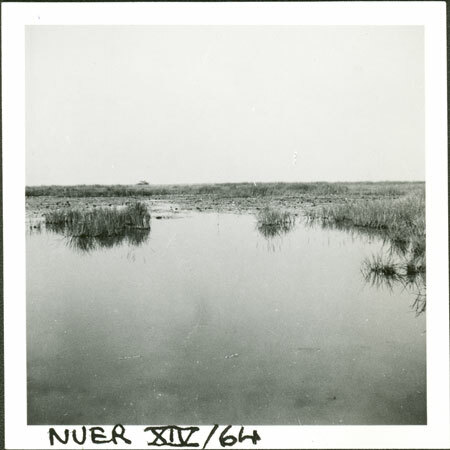 "Nuer swamp" Southern Sudan Project (in development). 03 Jan. 2006. Pitt Rivers Museum. <http://southernsudan.prm.ox.ac.uk/details/1998.355.682.2/>.